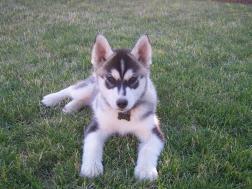 The Siberian Husky is a medium sized breed originally imported in 1908 for the purpose of Dog Sled racing. They were then know as the Chukchi Sled Dog named after the Siberian nomadic tribe who are credited with the development of the breed. The little dogs were first laughed at because of their small size in comparison to the current mastiff type dogs in use. But they proved themselves to be exceptional sled dogs. The Siberian Husky is still used today on many competitive race teams. Siberian Huskies are one of the most entrancing breeds due to their unique look and friendly disposition. But before you fall in love with the looks there are some things you should know about the breed. They are definitely wonderful pets and very intelligent however, they are not right for every family. Siberians are very loving and make excellent companions. Siberians are great for athletic people and enjoy hiking, walking, jogging, and just about any other activity. Siberians are clowns and keep you laughing all the time! Siberians are attractive dogs with a wild look. Siberians are very intelligent and get bored easily. Siberians love everyone and will greet a burglar with the same enthusiasm as they do you! Because of this they are poor watchdogs. Siberians can NEVER be trusted off leash. Even the most well trained Siberian will take the opportunity to "run free" if given it. This is a deadly situation that you must NEVER allow a Siberian to be put in. Siberians have a high prey drive. They may kill small animals including cats. Siberians are escape artists. Some are worse than others and some require a literal fortress instead of a fenced yard. Siberians dig period. I have never found a solution to this problem. They just do it and you cannot stop them! If you cannot live with this, then look for a different breed. Siberians are very pack-oriented. They cannot tolerate long periods of isolation. If you work long hours you will need to get your dog a companion or look into a different breed. Siberians shed a HUGE amount of fur twice a year. If you value a spotless home this may not be the breed for you. The Siberian Husky makes a wonderful companion. They thrive on attention, and long walks in the park. Most are good with older children. The only danger with very young children is that he Siberian may be so eager to play with the child they may knock it over in exuberance. Siberians love to go anywhere with their owners. It used to be that if one wanted to show a dog in obedience it was recommended that one purchase a Golden Retriever, Labrador Retriever, Border Collie, Shetland Sheepdog, German Shepherd, or an of the many breeds labeled as "intelligent". However, now that trainers are using more positive methods of motivation they are discovering that most breeds can do obedience and do fairly well. There are more and more people exhibiting Siberian Huskies in obedience. There are people who are getting High In Trial at all breed trials with their Siberians. So, it can be done! DO establish yourself as pack leader early. This will make the training easier. A dog who does not respect you will not want to do what you ask. DO use positive motivational training as much as possible. Only use corrections when the dog understands what you are asking. DO keep you training sessions short and upbeat. Use a lot of play and silliness. DO find a toy or treat that your dog would just die for and use it as a bonus reward for when he/she does something extra special. DON'T bore your Siberian with too many repetitions of the same exercise. Once they do it right once, quit. DON'T train if you are in a bad mood. That bad mood goes right down the leash to the dog. They will know it. DON'T correct your dog out of anger. You are correcting the behavior not the dog. DO HAVE FUN! Training your dog is supposed to be fun. If you are not having fun, you should look back and re-evaluate your goals. The Siberian Husky is the only purebred dog still competitive on todays race circuit. Any Siberian or medium to large size dog can be trained to pull. Whether it be to pull it's owner on skis or inline skates, a small team for recreation, or to race for fun or be competitive. If one wishes to be competitive one must get a dog from a breeder who selects for working ability as their number one criteria in their breeding program. © Copyright 2006 Thomas Eskridge dba Eskridge Kennel All rights reserved.